Please refer to the ADPC or DPCC Breeder list if you are wanting a puppy from a reliable breeder. Normally our litters are sold with tails docked, dew claws removed, and ears cropped. We have on occasion sold a few puppies with uncropped ears upon request. 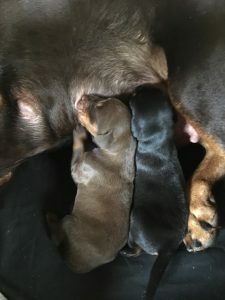 Unless we are shipping to a place that does not allow cropped dogs to show, these will only be puppies we are not deciding between for show, at the time of cropping which is generally around 8 weeks of age. The owners also must clearly be a “forever home” for the dog, since uncropped puppies can be harder to rehome if there is a problem. While there may be several puppies of show quality in a litter, generally we only keep or place the ones for whom we have show homes, and the others will be sold to either performance (agility, obedience, rally obedience etc) homes or placed in a home as a pet/companion puppy. All puppies will have at least 1 set of vaccinations and sometimes 2. We have changed our vaccine protocol to include an earlier parvovirus shot since this is such a devastating and contagious disease and dogs of black/tan pattern are more affected by it with whole litters sometimes lost. This will usually mean the puppies have at least 2 parvo shots prior to going home. All pet/companion puppies are sold on a Non-Breeding contract and are to be spayed or neutered at an appropriate age. I recommend all puppies are socialized, and attend puppy classes (but only after they are properly protected by vaccines). All owners are encouraged to train their dogs, regardless of whether they ever compete. Dobermans need exercise, interaction, and a job!